We are excited to announce a brand new opportunity for Remote Psychics: Video Readers with PsychicNetworkers! This service promises rapid growth and maximum exposure through television commercials and live TV shows world-wide! This is an exciting, brand-new service that allows readers to earn a substantial income providing video psychic readings to clients around the world. Its an opportunity to get in on the ground-floor of the next big thing in the Psychic Industry! HELP WANTED: Psychics, Tarot Readers, Astrologers. Must have previous experience providing readings for clients. Previous experience providing remote readings required. Previous experience providing readings using Video equipment preferred, but not required. Must be able to provide a professional image that positively represents the network. We search for independent contractors who are leaders in their specialties and provide compassionate, dynamic readings. Earn $12.00 – $180.00 per hour of reading-time, based on the rate you set. With this system you will need a computer with high-speed internet and an internet camera. When you are ready to work, you will sign into the website and make yourself available. Customers will be able to communicate with you by typing questions in your “free chat” room. The customers will be able to see and hear you. When a customer chooses to enter a private reading with you, they will be able to turn their camera and microphone on as well. You will earn a per-minute rate of pay for time spent in private readings based on the current per-minute rate you choose to charge your customers. ADVERTISING: This service is being advertised worldwide through television commercials and live psychic call-in shows. Our readers are even featured live on the TV during many of these shows, providing maximum exposure opportunities. REQUIREMENTS: You will be an independent contractor and can set your own schedule by logging in whenever you wish, 24/7. 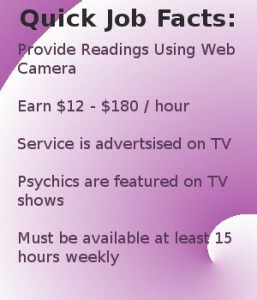 However, we only have open listings available with psychics who are interested in working at least 15 hours a week. Must meet our high-quality reader requirements by providing unique and dynamic readings. Must have a home-office that provides a private, quiet and camera-friendly place to provide readings. Must have a computer that meets technical specifications, camera, and high-speed internet. INTERVIEW PROCESS: Psychics will need to complete our online application. If our recruiting team is interested in discussing your application, we will schedule an interview with you. You will also need to provide a sample reading and demonstration of your video capabilities.